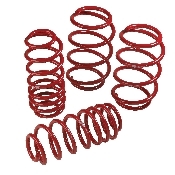 Featuring TRD’s durable bold red powder coat finish for superior corrosion resistance, the lowering springs have been rigorously tested and engineered to help ensure against rattles, clunking or rubbing—even when pushed to the limit. Enhances on-road vehicle performance—quicker turn-in, enhanced steering response and improved cornering. Features TRD-developed proprietary spring rate (linear in front, progressive in rear). Lowers vehicle’s center of gravity by 0.5” in front and 1.5” in rear. Rigorously tested through the slalom, on the skid pad and around a high-speed road course. Engineered to help ensure against rattling, clunking or rubbing—even when pushed to the limit. Designed to work with stock struts. Note: Spring Rates: 177# front / 217# rear. Lowers vehicle 1 inch in the front and 1.5 inches in the rear.